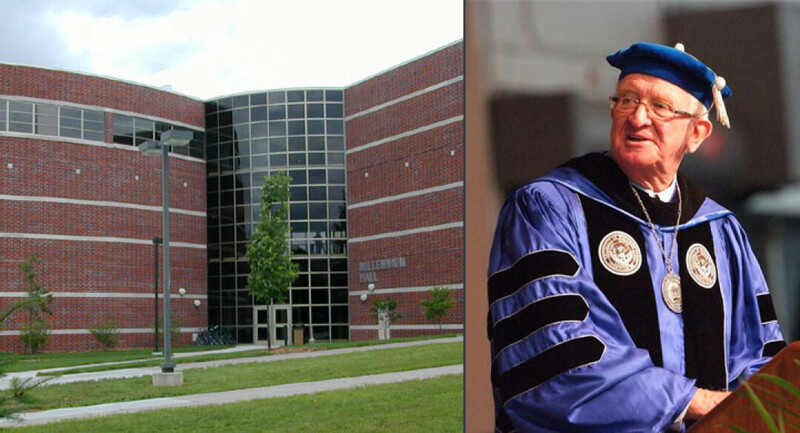 Millennium Hall at UW-Stout will now be known as Sorensen Hall, Chancellor Bob Meyer announced recently. “This is an extremely fitting honor for a great chancellor, a great leader, and a giant in higher education in Wisconsin,” Meyer said of Sorensen, who was UW-Stout’s chancellor from 1988 until his retirement in 2014. Sorensen died in February of complications from a stroke. The name change was endorsed by UW-Stout’s Memorials and Honors Committee and was subsequently unanimously approved by the UW System Board of Regents. The 35,000-square-foot hall was built during Sorensen’s tenure and was dedicated May 4, 2001. It replaced the outdated Communications Center and houses the Learning and Information Technology Department, the Nakatani Teaching and Learning Center, the ASK5000 Help Desk, and the Admissions Office.